GCU News Bureau The skies opened over Grand Canyon University (and pretty much across the Phoenix metropolitan area) and in some places, more than five inches of rain fell Monday. Gerrard Carmichael of Event Services and GCU Today were out on campus with students who enjoyed Arizona’s version of a snow day. Among them were sophomore Chloe Graves, an exercise science major and member of the women’s lacrosse team, who used the nice weather as an opportunity to read a book from her hammock. Graves, from Anchorage, Alaska, was very familiar with the term “snow day.” Not so for freshmen Joe Schwab (in fishing photo, left) and Zach Cornelius, both from California, who decided to test their luck fishing in the makeshift lake that in drier times is the Intramural Field. “We got a couple of nibbles, no bites yet,” Schwab joked. 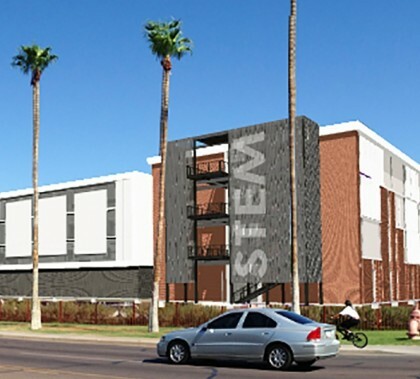 Director of Athletics Keith Baker said the GCU Soccer Field was almost completely engulfed, and water ran off into the North Gym to the south, including the women’s softball locker room. The huge high jump pit floated from next to the field all the way to the track. The softball field also was submerged. Former Republican vice presidential candidate Sarah Palin and filmmaker/author Dinesh D’Souza rallied Christian conservatives at Grand Canyon University Arena on Thursday night. The event drew nearly 2,000 GCU students, staff, and other Valley visitors. 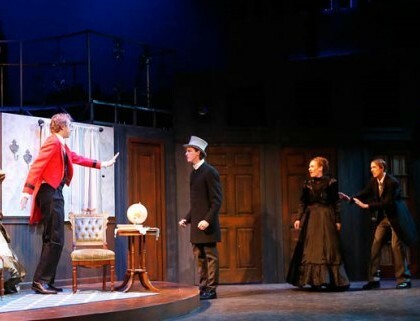 “Sherlock Holmes: The Final Adventure,” the first play of the 2014-15 Ethington Theatre Series by GCU’s College of Fine Arts and Production, had it all: spectacular sets, charming costumes, solid story and ace acting performances all around. Tickets are sold out, but there is a waiting list. Call 602-639-8880.